Charisse is a striking, statuesque silver grey female and comes from a long line of grey and brown Chileans including her sire, Socosani’s Signet of Woodsedge, and SA Huckleberry on her dam’s side. Charisee’s outstanding conformation is evident in the way she carries herself with her ruler straight topline and square, balanced proportion; and she passes this strength on to her offspring. Her original owners, Steve and Rose Ann Knoblock, who know fiber, described Charisse’s fleece as having great handle that a handspinner would appreciate! Charisse has proven to be an excellent breeding female. She conceives and births easily, is an attentive mom and has solid milk production. She is also the “auntie” for the herd, keeping all of the crias in check! 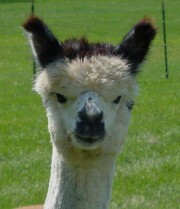 Charisse has had 7 cria … all females, 5 grey! Her first cria, Bellissa, is out of Knoblock’s Prairie Ranch’s 6Peruvian Garcia (Fawn). Her 2nd, Hadleigh is out of our own el Numero Uno (TB). We liked that combination so much, that we repeated it, giving us Platinum Plus in May 2008 who is lighter, like mom. In 2009, bred to Calix (DF), Charisse produced Anani. For 2010, we bred Charisse to Quentin (BG) which produced Galena. She was then bred to Max, who is light brown and has consistently produced beautiful dark brown when bred to grey (Osanna 2011 and Dee Dee 2013). For her 2015 cria, Charisse is bred to our color champ Golden Sovereign and it will be exciting to see what that produces!